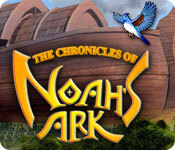 One of the most amazing stories in the history of mankind is presented once again in The Chronicles of Noah's Ark! Absorbing music with traditional stylings! The Chronicles of Noah's Ark is rated 3.9 out of 5 by 45. Rated 5 out of 5 by katnap1 from A great game I don't have a lot to say about this game except I love it. The story line, the music, the graphics - just great. No witches, no sorcerers and no ghosts. Thanks Big Fish for a great game. Rated 5 out of 5 by honeyg412 from Finally a wholesome game on BFG! There are some who have commented that this game shouldn't be on BFG or that it should have been on a religious site. I personally think those comments are unfair to the many gamers, including myself, who've become tired of the 100's of games put out by BF each year that are all about evil, death, blood and gore. I applaud BF for releasing this game. There are all kinds of buyers here and for those that don't like the inclusion of God in a game they don't have to buy them. But please respect that there are those of us who appreciate the change and would like to see more games like this offered. Rated 5 out of 5 by KatRoy2 from awesome There is no, no killing, dark spirits, death, fighting, praise the Lord. Its fun, bright colors, and bible verses. I would love more games like this. It would be a great kids game for 6 and 7 year old. It took a lot of courage to create this game. So thank you very much for reaching out. Rated 5 out of 5 by BelfortOwl from Excellent game & nice graphics! I loved this game and was so happy to see it offered. I love to wind down with Match 3 games. This is a very, very welcome surprise. The story and graphics were great. And the puzzles were a challenge, but great for all ages. Thank you! Rated 5 out of 5 by megs56 from THANKS FOR BRINGING GOD INTO GAMING This is a lovely little refreshing game which tells a Bible story and would be great for kids. Thank you to the developers for giving us something good and wholesome, I am so happy to see that this is getting high reviews here on Big Fish. Thank you once again. Rated 5 out of 5 by mikesilverman from HELP SAVE NOAH AND HIS FAMILY FROM THE FLOOD This is a very charming little game that faithfully tells the story of the biblical account of Noah's Ark. No corners were cut, it actually gets the story right. 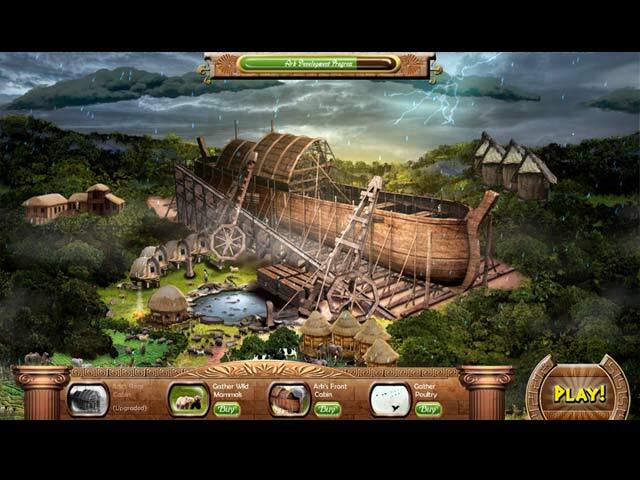 Through audio and nicely-drawn visuals you see Noah and his family interact as he takes up the task of constructing the Ark. The game has a typical Match-3 style game board, and each round had goals to reach for collecting certain types of tiles. You can play with or without a timer. 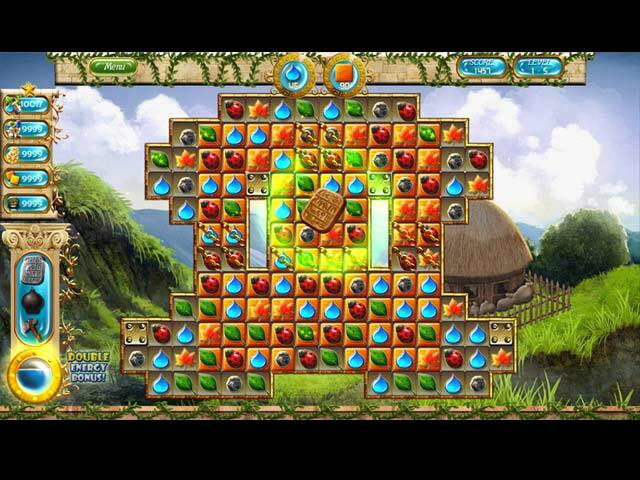 The game tiles depict various creatures and plants and objects in clean clear well-designed graphics that fall and bounce off the screen as you match them three-or-more in a row or column. 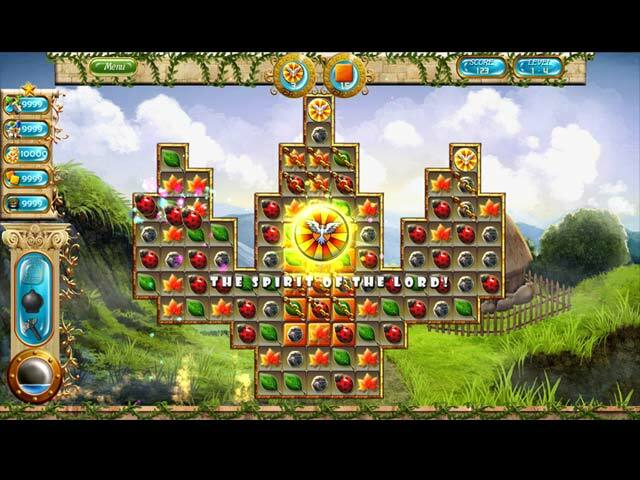 Some boards contains elements that tie-in to the story, such as disks with doves on them that contain the "word of God" that you must lower to the bottom of the game board after which you are told vocally that "The spirit of The Lord is upon you!". As you complete each board you earn resources that help Noah in the steps toward building and completing the Ark. There are power-up items as well, an axe and a bomb and a stone tablet that each can be used to remove a certain number of tiles from the screen. After using one of the power-ups the power-up will re-energize and become available again as quickly as you can make multiple matches of 4 or more tiles to refil the energy meter. The game is also fun to play because it strikes the right balance between being challenging without being too hard to complete each board. The theme, the visuals and the story of this match-3 game makes it a stand-out from all the others of its type. I highly recommend it. Rated 5 out of 5 by thuett007 from Uplifing Game - Nothing Evil in this One! I am glad to see something offered without death, demons and the occult. Enjoyed this game, pretty much true to story. If you liked Cradle of Rome or Cradle of Egypt, this game is similar. My go to games for relaxing fun and brain exercise! Thanks Big Fish - keep these types of games coming!